The High-Performance Hogh-Speed (HSS-E-PM) Taps are manufactured to both ANSI and DIN standards from powder metal, offering high productivity and reliable thread quality and are engineered for greater wear and heat resistance. 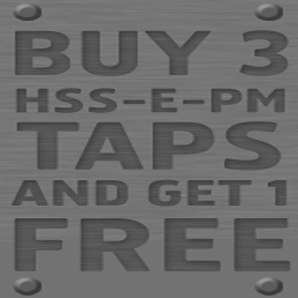 Buy 3 HSS-E-PM Taps and get 1 free! The 4th HSS-E-PM Tap will be deducted at the check-out.